The Fourmile Creek Master Plan is now complete. See the “Documents” tab to read the complete master plan. 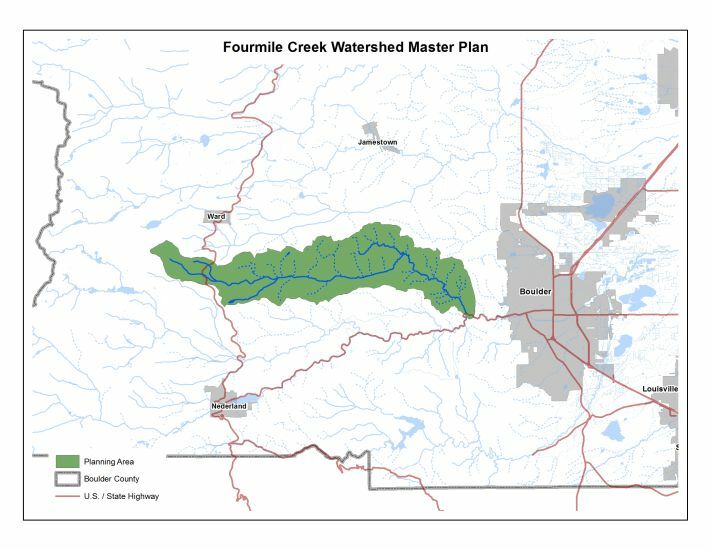 The Fourmile Watershed Coalition is operating as the Watershed Coalition for Fourmile Creek. The Four Mile Fire Protection District is the fiscal agent for the Coalition. The Fourmile Watershed Coalition will be sharing information about watershed recovery projects and other activities, identifying funding opportunities, and may be directly implementing projects of interest to landowners and county residents. Boulder County has received grant funding for stream restoration design of Upper Fourmile Creek, Lower Fourmile Creek, and Gold Run. Boulder County’s consultants are in the process of developing draft designs. As drafts are complete, property owners and community members will have the opportunity to provide feedback on the draft designs. Community outreach meetings were held after the 2013 Flood to gather input from land owners along Fourmile Creek. See below for notes from these meetings.